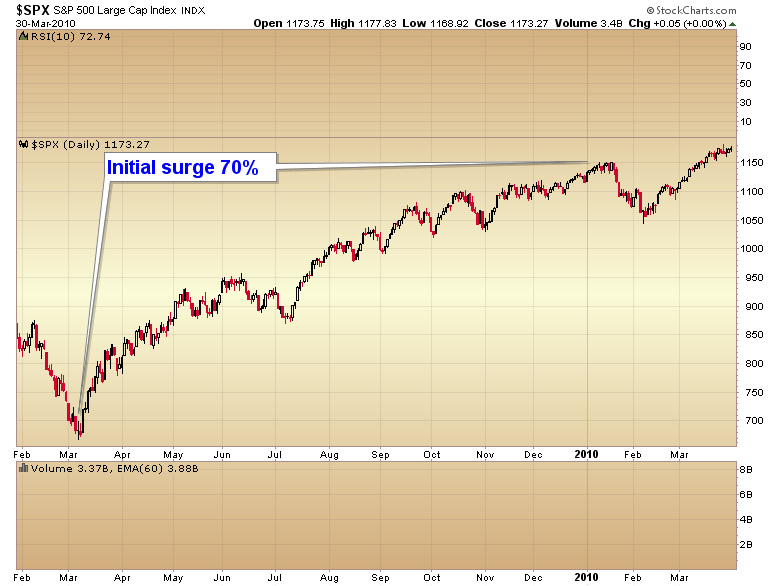 Last week I wrote an article on why I think the bull market in stocks is coming to an end. As usual the retail public is chasing a move that is extremely mature and ripe to reverse, while assuming that the current trend will continue. Amateurs always make this mistake at tops ... and bottoms. Their emotions tell them the move will continue indefinitely. It never does. As you can see in this next chart, dumb money traders are becoming more and more confident the further this parabolic move progresses. Professional traders, on the other hand, get more and more nervous as the market stretches further and further above the mean. I can assure you we are not done with the secular bear market in stocks that began in 2000. All the Fed has managed to do is blow another bubble in the stock market. And this bubble has again reached levels of overvaluation that will eventually collapse the market just as was the outcome in 2007. 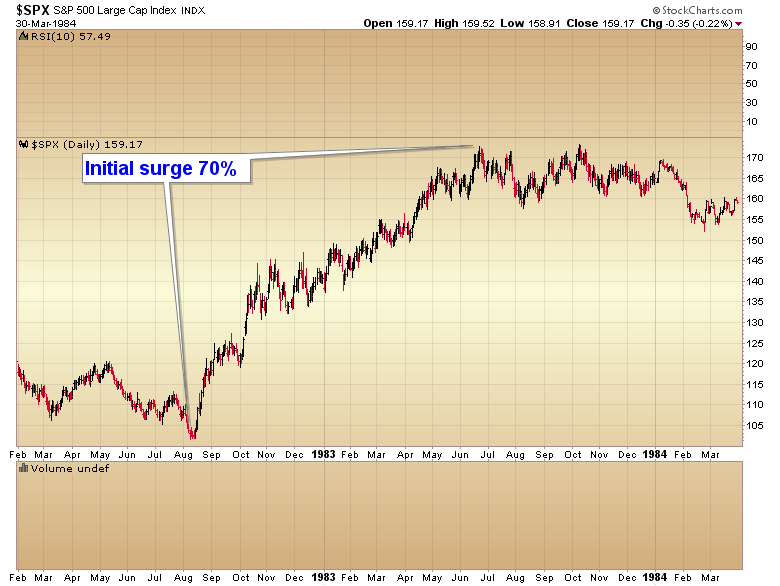 The following chart illustrates that the stock market's P/E ratio is again at a historically extended level. 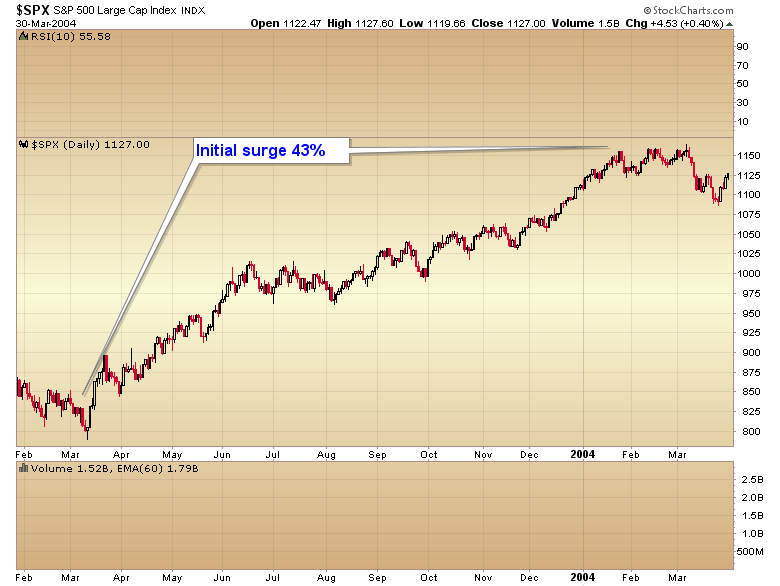 The current reading of 26.30 is at a level where most bull markets top. Also, notice the extreme overvaluation in 2000 (P/E ratio of 45). This overvaluation was not corrected by one brief move back to the historical mean P/E ratio of 15; an overvaluation as extreme as what culminated in 2000 requires a corrective move that is equally extreme in the downward direction. An overvaluation as extreme as what occurred in 2000 is going to require a move just as extreme in the opposite direction before we finally clear this market of the excesses that were created during the tech bubble, and exacerbated by the real estate bubble. I don't expect this secular bear market will be finished until we reach P/E ratios similar to 1932. On the other hand, while retail traders are chasing the bubble, professional traders are looking for real opportunities. I think I can say without any hesitation, real opportunity is not going to be found in the stock market after a five year bull run. 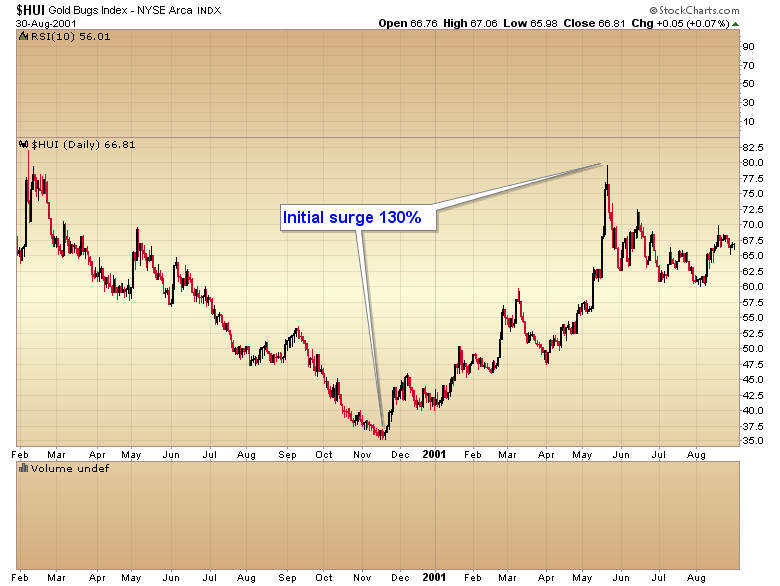 As a matter of fact if one can pick a bear market bottom the initial surge will often gain 40%-100% in the first few months. These kind of gains certainly make it worth the frustration and whipsaws that are almost always incurred trying to pick a final bottom. 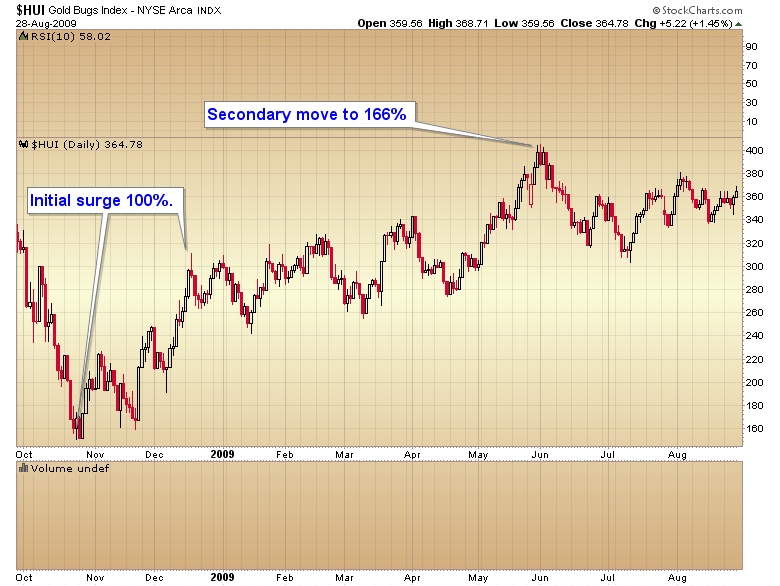 The following three charts of the S&P 500 (1982, 2003 and 2009) illustrate this point. Not surprisingly the more severe the bear, the more violent the rally is once the final bottom has formed, and the bigger the bull market that follows. 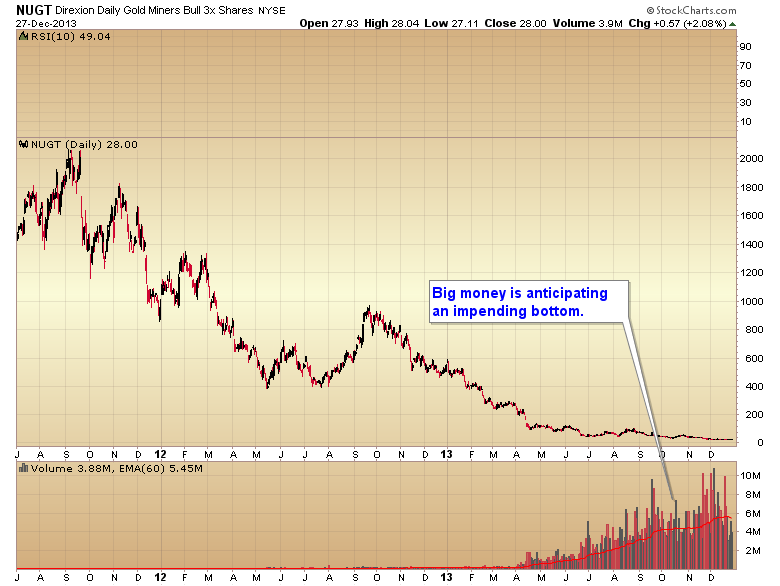 Here are two examples of extreme bear markets, and the initial rallies off of those final bottoms (HUI - Gold Bugs Index 2000 and 2008). 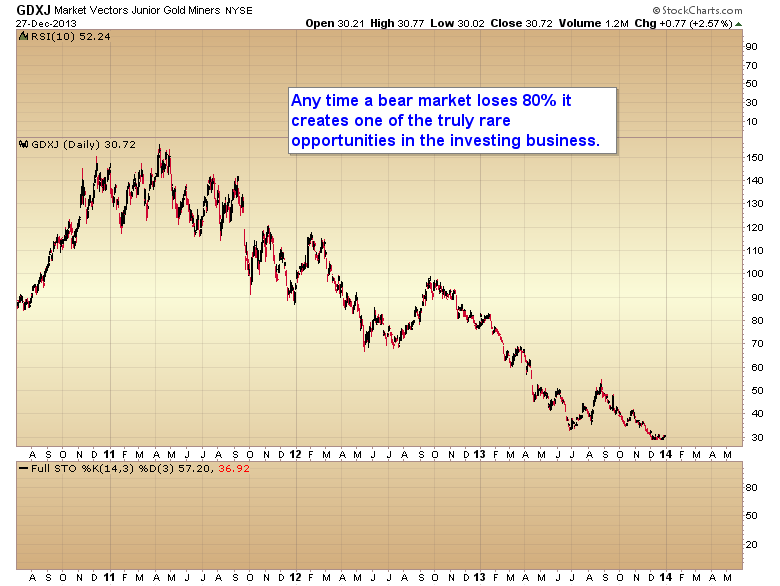 Now let me show you one of the most extreme bear markets of the last 30 years (GDXJ - Junior Gold Miners Index ETF). While retail investors are blindly plowing money into an overvalued, overextended, overbought and parabolic stock market, professional traders are quietly accumulating massive positions in preparation for the end of one of the most severe bear markets in decades. Once we have confirmation that the final bottom has been printed, I'm expecting at the very least an initial surge over the first 3-4 months to test the 2012 resistance zone. 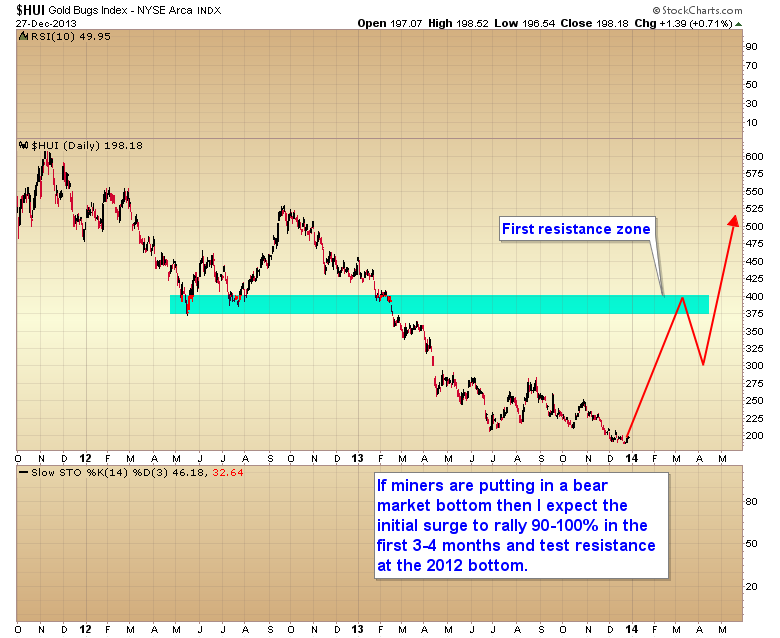 That would be a move of almost 100% (see HUI chart below). I'll say it again; picking bear market bottoms isn't easy. Very few people have the patience, conviction and endurance that it takes to survive the volatility of a bear market bottom. Especially when everyone else they know is making money buying into the latest bubble. But human nature never changes, and those people always get caught when the bubble pops. Tech investors, real estate investors, and possibly Bit Coin investors come to mind. In contrast, the few traders that can hold on and survive a bear market bottom become the millionaires and billionaires of tomorrow.